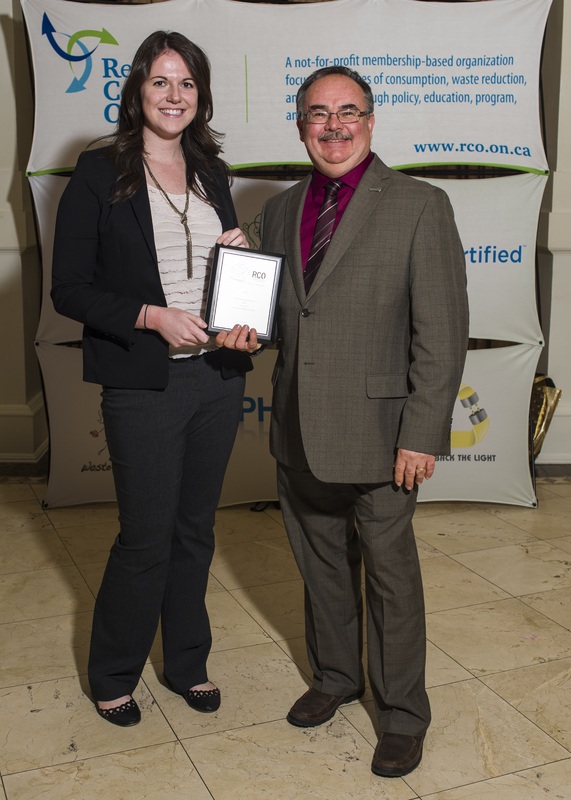 At the Recycling Council of Ontario (RCO) Awards Gala in Toronto, representatives from the Facilities Management Division received Western’s third consecutive Waste Minimization Award. The annual event recognizes organizations across the province for their efforts in waste reduction and diversion. Western increased its score this year, earning a Silver Award. Several recent advancements in the University's waste collection processes can be directly linked to the University’s success. For example, this year, 160 new outdoor recycling receptacles were strategically placed around campus in high traffic areas and labeled with images to help users properly sort and dispose of their waste. Western has been composting in its kitchens around campus since 1997 and beginning in 2013, suite-style residences were equipped with mini organics recycling bins in each suite. Western has also been a leader in the community, hosting activities promoting a sustainability-driven culture, such as the Campus Clean-Up, Zero Waste BBQs, and an E-Waste Drive. Western aims to divert 80% of waste from landfill over the next five years. To achieve this goal, Western plans to ensure every garbage bin on campus also has a place for recycling, as well as further developing composting programs. The entire Western community should be proud of being a part of the University's growing achievements in sustainability. This award is further proof that the campus community is committed to supporting top-notch waste diversion programs and infrastructure.